When I was younger I always wanted to wear denim from head to toe. I wanted a denim jacket, pants, shoes and a bag but I never got it. Now that I'm older I can now where denim from head to toe(yay lol), well excluding the bag and shoes because that would be way too much. Today's outfit is simple , you can never go wrong with denim in my opinion. What I did today was pair two similar denim shades. I feel like when wearing denim you can either keep the colors in the same tone or contrasting tones and it would still work. I decided to go with orange sandals because I just feel like orange and brown are the best complimentary colours for denim. Please, no comments on my messy baby hair, I know. Oh yeah, with all this impersonating and copyright violations going on I've decided to start putting my name in my pictures; better safe than sorry! How do you like to wear denim on denim? Thanks. Yeah better safe than sorry. You can never go wrong with the denim on denim look. Love the purse!! I'm an advocate of denim on denim! I wear it so much that I cant even blog it. You guys would think I'm wearing the same ting over and over! 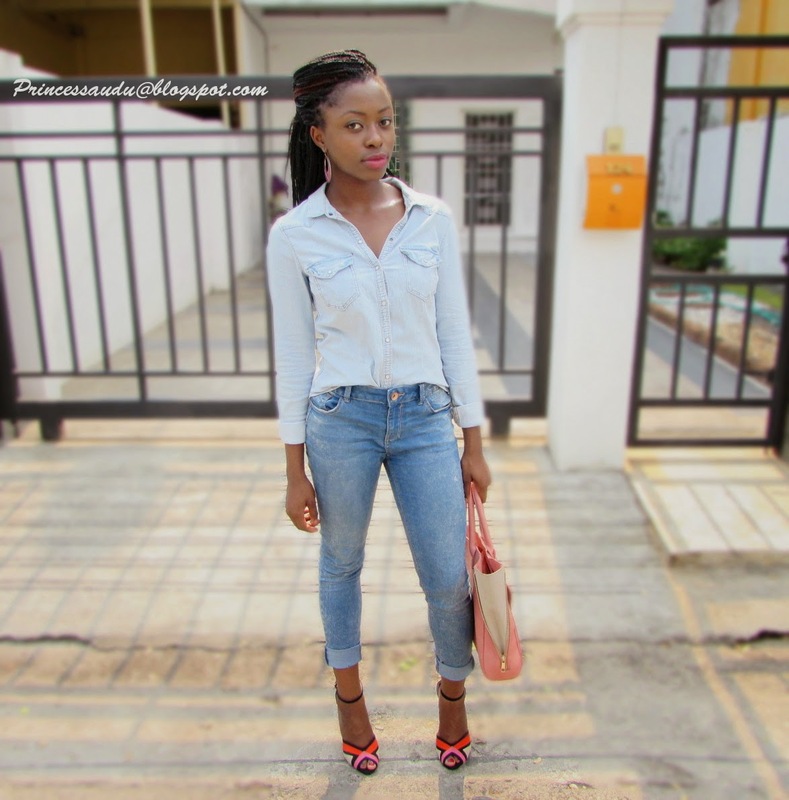 lol, its my go-to outfit..
Love love your denim on denim look!!! I don't know if I could pull off double denim but you look fantastic!! Thanks, I'm sure you can pull it off after all you cant go wrong with denim. Simple yet very chic! Love the double denim! You look fab! But your heels and bag are catching my eye. So stunning! Hope you have some time to visit my new blog! Love this denim on denim look! Looks great with the colourful heels! Gorgeous! I like to wear denim on denim..and I love your outfit, shoes and bag are great!! Jolie !!! Love your look ! Love that your shoes and purse added the right amount of color to this casual look. FABULOUS!